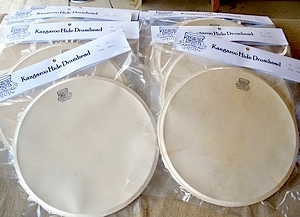 Kentville Drums is an Australian company who make and restore drums, and also produces traditionally made heads from ethically sourced kangaroo hides. The heads the company offers are available in standard sizes from 10” through to 24”, and common pre-international sizes (to suit vintage British drums), from 9 5/8” through to 21 5/8”. Odd sizes can be custom made on request. 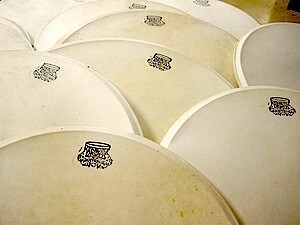 Also produced are self-adhesive kangaroo hide bass drum strike patches and ‘Hoop-a-roo’ hoop protectors as well. The heads come in three gauges, fine (8-10mil), medium (10-12mil0, and heavy (12-14mil). The review head I was given was a 14” heavy gauge model. Kentville laps its heads to solid aluminium flesh hoops, which it says provides great strength, tuning accuracy and durability. Traditional maple flesh hoops are also available by request. I tried the head on a bubinga snare drum which had brass triple flanged hoops. 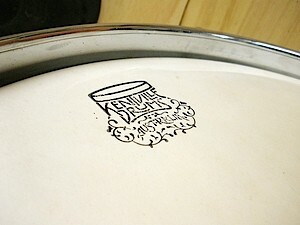 The drum had a Remo hazy snare side on the bottom. In practice, the head was easy to fit to the drum and I had no issues with either seating it on the bearing edge or within the hoop. It was quite light and flexible. I’ve said this before, but this isn’t personally my type of head. However, I will absolutely concede that this was probably the best this particular drum had ever sounded since I got it. As you’ll hear – with headphones anyway – the head/drum was full sounding with plenty of character and ring. As the head was tensioned higher, it became more controlled but there was still lots of tone to it. I only tried the drum with sticks, but obviously it would be good for brush playing too. I only had the one head to try out, but as mentioned, the company does do heads of all sizes so a full kit can be equipped, and you can hear what that sounds like via the link below. It’s a bit difficult to judge a whole line by one solitary example. That said though, this head really did make my snare drum sing and that impressed me, so just on that basis I’d say they’re worth a try if you’re wanting something which gives a natural feeling with lots of tone or something other than a plastic head.